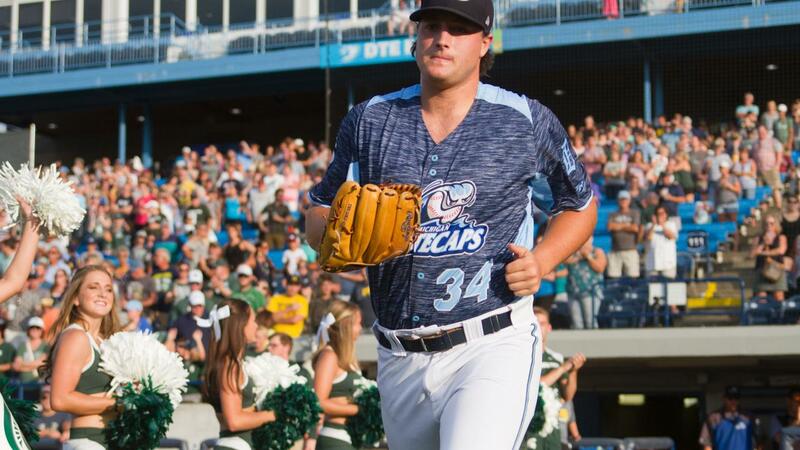 COMSTOCK PARK, MI - The West Michigan Whitecaps shut out the Great Lakes Loons 6-0 in Game 1 of the Midwest League Eastern Division Quarterfinals thanks to a dominant performance from pitcher Brad Bass Wednesday night at Fifth Third Ballpark. Bass, a native of New Lenox, Illinois, kept hitters off-balance striking out seven batters through seven innings of scoreless baseball en route to the shutout win. The Whitecaps struck in the first inning when Loons starting pitcher Gerardo Carrillo underthrew his first baseman on a pickoff attempt, one of two critical errors for the Loons, scoring Reece Hampton from third to give the 'Caps a 1-0 advantage. Meanwhile, Bass dominated the Loons lineup, tossing seven innings of scoreless baseball while striking out seven without issuing a walk in the contest. In the fifth, Eric De La Rosa lifted a sacrifice fly to score Policelli from third before an overthrow to third from first baseman Devin Mann allowed Anthony Periera to cross the plate scoring two runs and increasing the 'Caps lead to 3-0. Chris Proctor cleared the bases in the sixth lacing a three-run double and doubling the 'Caps edge to 6-0. The Loons threatened with men on first and second with one out in the ninth but couldn't convert as the Whitecaps blanked the Loons 6-0. Bass (1-0) threw seven scoreless innings allowing six hits while striking out seven in his first win of the postseason. Carrillo (0-1) pitched 5.1 innings permitting six runs on seven hits in the loss. With the win, the Whitecaps need to win one of their next two road contests against the Loons to clinch a spot in the 2018 Midwest League Eastern Division Finals. Wednesday's tilt marked the 100th postseason game in Whitecaps team history. The Whitecaps hold a 60-40 record in playoff games since their inception in 1994. The Whitecaps play Game 2 of this Midwest League Eastern Division Quarterfinal against the Great Lakes Loons Thursday at 7:05 pm from Dow Diamond. Pitcher Wilkel Hernandez gets the start for West Michigan against Great Lakes lefty John Rooney. Broadcast coverage with Dan Hasty begins on the Whitecaps Baseball Network at 6:55 pm. Tickets are available for any Whitecaps 2018 home contest by calling the Whitecaps front office at 616-784-4131 or by visiting www.whitecapsbaseball.com.